Last week I told you that this month we will be focusing on Thanksgiving each Wednesday in November. Go here if you missed my introductory post on gratitude. I think it is really important for us to give thanks and praise to God for the things he has blessed us with, including the simple, small things that we usually take for granted. I hope that you have taken my advice and are writing down 1 thing you are thankful for each day this month. Focusing on these things will help us have a joyful attitude and outlook, even when things are not going our way. God calls us to "give thanks in all circumstances," good, bad or indifferent. We should trust Him enough to thank Him for everything we experience, knowing that He is in control, that He knows what is best for us, that His will is perfect, and that "He works all things together for good" and for His ultimate glory. I suggest you display a reminder in your home. One idea is to print out the banner pictured above. You can hang this anywhere in your home, preferably somewhere that you will see it each day. And everytime you see it, simply send up a prayer to God thanking Him for 1 thing He has blessed you with. I have a similar banner hanging in my home. It was made by 517 Creations out of fabric and it says, "thankful." I have it hanging on my mantel, making it the first thing you see when you walk through the front door. I love this simple reminder. 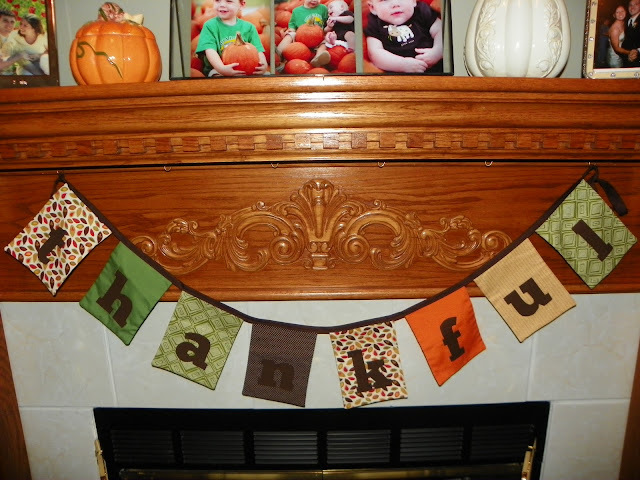 I am sure Mary Jo would make one for you too if you would rather have a fabric banner and do not sew. You can choose your fabric and saying. If you do not want to mess with a banner, another idea is to display the following verse somewhere in your home. So tell me, what are you thankful for this week? I am thankful for a roof over my head, clothes to wear, food to eat and a beautiful, loving family to share my life with. Are you grateful for what God has done in your life? Ask Him to give you a thankful heart. Side note: Today is the last day you can bid on fabulous items to help the Mercy House, a maternity home that brings hope to the woman of Kenya, including a fun prize package from Worthy of the Prize and Scripture Art Designs. Go here to do a little Christmas shopping and support a great cause! Spread the word! !